A major upgrade of Dominion Rd to create peak hour bus lanes along most of the road and upgrade its three village centres has been approved by Auckland Transport. The $47 million project also includes new cycle routes through quieter roads either side of Dominion Rd. Construction is expected to begin in early 2014, subject to NZTA funding approval. Dominion Rd is one of the few transport corridors in Auckland where there are more bus passengers than drivers in peak hours. It carries about 2.2 million bus passengers a year, three per cent of the entire region’s public transport trips. Dominion Rd’s current piecemeal sections of bus lanes will be joined up to create continuous lanes in peak hours between State Highway 20 and View Rd. The bus lanes will also extend through intersections, which they do not at present. On-street parking will be retained at other times. The bus lane operating hours of 7am – 9am for the northbound lane and 4pm – 6pm for the southbound lane will not be changed as part of the upgrade. However they will be reviewed as part of a planned region-wide review of bus lane hours. The project will help improve the reliability of buses on Dominion Rd and increase its capacity so it can deal with an expected growth in travellers. A 30 per cent increase in transport trips is predicted along Dominion Rd. A review of the project allowed Auckland Transport to reduce the potential cost of the project by about $50m. This will be achieved by keeping the bus lane widths at 3m north of Mt Albert Rd, meaning expensive service relocations are not necessary. Between SH20 and Mt Albert Rd, which requires widening to create new bus lanes, they will be 4.5m. Auckland Transport board member and Albert-Eden Cr Christine Fletcher says at this stage the benefits of widening the bus lanes were not great enough to outweigh the significantly higher cost. “This upgrade will still deliver big improvements to bus reliability and travel times, as most of those come from having continuous bus lanes. It also means much needed upgrades for village centres and safer routes for cyclists. Albert-Eden Cr Cathy Casey says: “I am delighted that Auckland Transport’s board has listened to the people on Dominion Road and that the village centres of Mt Roskill, Balmoral and Eden Valley are to get their long awaited upgrades including new footpaths, trees, street furniture, pedestrian priority, and lighting improvements. Footpaths along the length of Dominion Rd will also be upgraded. The village centres of Mt Roskill, Balmoral and Eden Valley, will get upgrades, including new footpaths, trees, street furniture, pedestrian priority, and lighting improvements. Footpaths along the length of Dominion Rd will also be upgraded. Albert-Eden Local Board Chair Peter Haynes says the board is pleased that a start to the long-awaited work on Dominion Road is finally within sight. “The uncertainty caused by delays over the years has held back the development of the road, it has the potential to be one of Auckland’s great thoroughfares. “We welcome the upgrading in the village centres and of footpaths, pedestrian crossings and refuges between the centres. We are pleased that there will not be wholesale widening of the road, and that the plans to make the road into a highway like Balmoral Road are buried in the past. Puketapapa Local Board Chair Richard Barter says the board is pleased with the outcome. 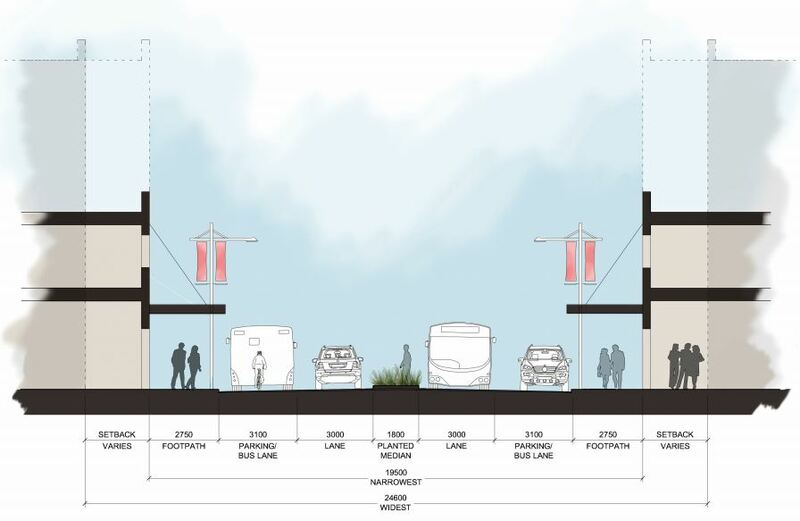 “The board acknowledges that the goal for the project is to improve bus services so appreciates the Auckland Transport Board’s support for the streetscape upgrades along Dominion Rd. This will further encourage the use of public transport and will be a boost for local business as the villages along the route will become attractive destinations. “The decision will create certainty for local residents who have been waiting for many years for the upgrade of the Mt Roskill Village. A commuter cyclist, Mr Barter says the safe cycle routes planned to run parallel to Dominion Rd will encourage local people to try commuting by bicycle. Public information days to update the community on the plans will be held on Saturday 17 November in Mt Eden and Wednesday 21 November in Mt Roskill. More information, including a video showing concepts for the upgrade, is at www.aucklandtransport.govt.nz. Its good that the bus lanes are being extended right up to the intersections but it seems odd that on what is one of the busiest and most successful bus corridors in entire region, a route that carries more people at peak via bus will still only be in operation for four hours a day and that outside of those there will be on street car parking. To be fair, this partly isn’t Auckland Transports fault as the local businesses still seem to think that it is cars that come in and buy things and not people. I do hope that once the street is upgraded that perhaps AT embark on a programme to change both of these aspects. They could remove 5% of the on street parks per year while also extending out the bus lane hours on a gradual basis so that people can get used to it. Personally I would love to see trams put back down Dominion Rd with them in the centre of the road but it will be a slow process to convince the business owners that allowing more people being able to get to the area easily will benefit them. Here is a video that AT has made showing what it may look like. – Dom rd is a uniquely successful PT route. We are going to be doing a separate post that focuses solely on the cycling proposals along with some suggestions so if you are thinking of firing a shot at AT about it, hold off till we get that post up. One question that AT haven’t answered yet though is what they now plan to do with the $50m they have saved but that was budgeted for in the long term plan, that could build a lot of alternative cycling infrastructure in other parts of the city. This is a great step forward to improving the urban environment. Some concerns: footpath width does not look wide enough to encourage cafes and the likes setting up outdoor seating and, ultimately there is still 4 lanes of traffic to cross. Obviously the major difficulty is incorporating bus lanes each way and thus making 4 lanes necessary; but in the future (perhaps next upgrade), it would be good to have one lane each way where traffic flow is determined by economic tools (congestion charging) rather than explicit lanes for every mode of transport under the sun. As for lack of cycling lanes, there is simply just not enough space. We should be integrating modes (lowering speed limits) not segregating them. I hope the improvements include speed limits at 30Kph. No speed limits are being proposed, though raised tables are proposed across many side roads, which should help with the speed of those turning movements. Currently, those side streets retain car priority (I have blogged on this in the link below), but they would be easy to design (or retrofit) with zebras. I’m not so convinced of the “planted median”. Pedestrians don’t want to walk over this (unless it is nice grass – though, I guess they want to encourage pedestrians to use the crossings), and the lack of a flush median could mean that cars that are turning into a side street will block all traffic from behind, until they are able to turn. Also, traffic turning into Dom road won’t be able to use the flush median, making it more difficult to turn right into the street. With regards to the bus lane timing, do buses need a dedicated bus lane during off-peak? What I mean is, is the car traffic heavy enough that the buses will be restricted? Or can the buses use the general lanes while still allowing parking? (that said, the bus lanes could probably be time-extended at LEAST by a bit, given Auckland’s long on-peak times and large amount of buses which use this road). The traffic from behind will just risk using the bus lane in operation to overtake the stationary car, causing dangerous situations, disrupting traffic flow in both lanes and possibly incur a fine which will ultimately result in the media crying foul over revenue-gathering. I presume there will be stretches of road that will have a median flush or turning bays to avoid this? Couldn’t the centre lane be grassy medians and ped refuge in some parts and turning lanes in others. This would make it part flush and part raised but that’s not a problem right? Sjac, there aren’t any dedicated bus lanes during the off peak. For better or worse they are peak only lanes that become parking at all other times. As for car traffic being heavy enough that buses are restricted, it’s almost the reverse situation across the day. Bus traffic will be so high on the all day pattern that cars and buses would be clogged to hell in one lane. The planned median in the plans I have seen during a meeting two days ago is mixed – part planted, part solid pavers (like on Queen Street near K’Road), and some sections have formal ped refuges. If the paver sections are common enough, the grass should not be an issue. Also, the raised medians will exist only in some small sections (compared to the whole length of Dom Road) anyway. Why should right turns be supported at all on such a busy road? These are the most disruptive and dangerous actions that cause delays, frustration, and accidents? Access to parking lots can be organised pretty easily from cross streets. This also allows more security for pedestrians and enables the built line to continue uninterrupted. 1) Ban all right turns, except at intersections. 2) At the very least, increase bus lane operating hours to 6am – 10am and 3pm – 7pm. Preferably just make them 24 7 – simple & easy to understand. I can sort of see why this proposal has been adopted but I would have preferred a median busway. A case of realpolitik, at least there is some progress forward. The AT video makes Dominion Road appear not to be densely populated or urbanised. Certainly not compared to Sydney or Melbourne arterial roads out of the respective CBDs (let alone somewhere such as Cologne or Bern). Maybe a case for 2 story high terrace housing experiment along Dominion Road. Complete with compact street frontage, larger back yards or plots that because of North-South orientation share the sun nicely, and crucially, those back service lanes that encourage off street parking. It is that sort of development, along with the growth in human activity that goes along with this type of development that will ensure Dominion Road gets revisited in future for a better outcome. I live on Dominion Rd and I continue to wonder about the low density of housing in the area. One example of a very low density area just 100m from a shopping area is the blocks between Keystone Ave, Dominion Rd and Duke Street. Have a look at the green on this Google maps view: http://goo.gl/maps/mzQf9 ( and note most of the houses are state or ex-state ones, not mansions). Agree. Big projects like this should have ambitious land use plans going with them. In order for the Dominion Road Business Association (DRBA) to better understand that having no parking at any time of the night or day on Dom Rd is not going to affect the businesses of their members, this partial road upgrade is the way to go. Over the next 3-4 years, AT / AC can through collection and analysis of data on how people are visiting the various parts of Dominion Road, share that with the DRBA, working with the association to consider a possible further ‘upgrade’ to the road in 2017. Hopefully incoming Board Chairman Lester Levy will impress upon AT, the need for a two-way customer engagement / education strategy – listen, understand, assess, educate, review, implement.